Can a palm tree be planted next to the pond/terrace? A frequently heard and justified question: can a palm be planted next to a pond or pool without risk? In this article we dive into the root system of the palm to answer this question! Palms are monocots and therefore have a different root system than a typical deciduous tree. 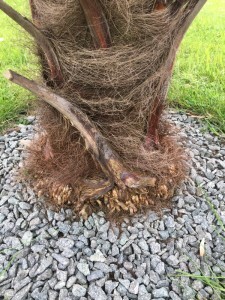 This is reflected not only in the different approach to the planting itself, but also in the further development of the root system. The seedling develops differently as early as germination. From the seed emerges a hyperphyll which will divide in a coleoptil (ligule) from where the first leaf emerges and a radicle which is the first real root. 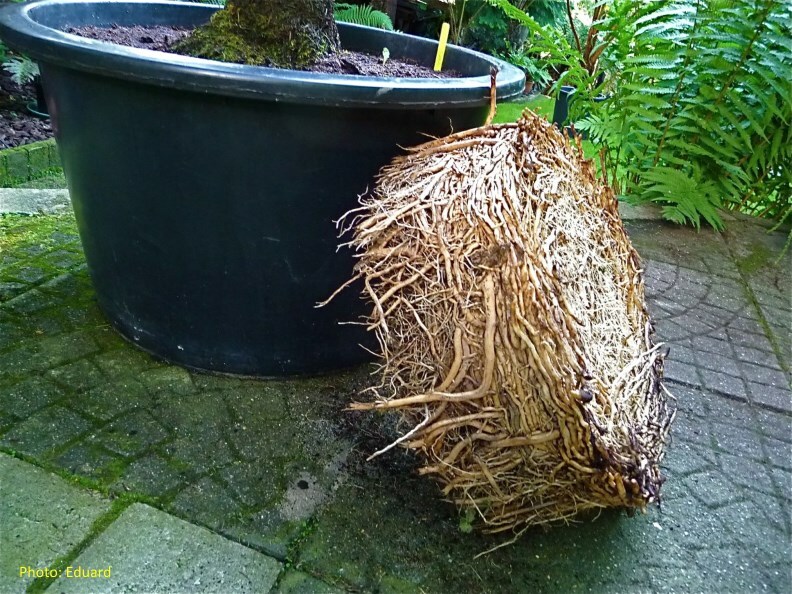 Afterwards, the roots develop further with special functions depending on their position and depth in the soil. We divide the root system, the rhizosphere, into 4 zones. The respiratory zone. This zone is no more than about 25 cm (1 ft) deep and reaches a maximum of 50 cm (1,8 ft) from the trunk. We find here both primary and secondary geotropic roots. In other words, they are led downwards by gravity. In this zone we also the transition from stem to roots and the root tuber. The nutritional zone. The largest area of the rhizosphere and also containing the highest proportion of primary and secondary roots. The zone stretches between 90 and 150 cm (2 ft 11 in – 4 ft 11 in) in depth and width and reaches just a bit further in width than the palm leaves. The absorbing zone. The exact development of this root zone is highly dependent on the species and depth of groundwater. Normally this zone is about 150 to 180 cm (4 ft 11 in – 5 ft 11 in) deep. This zone contains mainly primary roots and the root density is significantly lower than in zone 2. Just like in zone 2, the actual absorption is also done here by the very fine root hairs. The development of the last zone depends entirely on the groundwater level. In areas where the groundwater is high, there is hardly any distinction between zone 3 & 4. 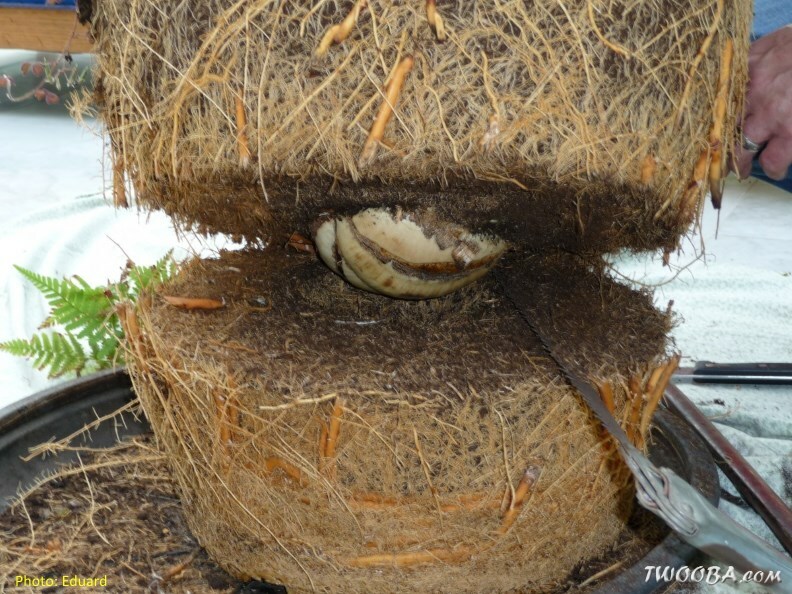 Over time, we also see roots appearing above ground just at the base of the palm. These are so-called adventitious roots that originate from the stem and provide extra strength. These may also give the impression that the palm has pushed itself upwards, but in fact it is only additional roots that become visible. Next to the pond or swimming pool? 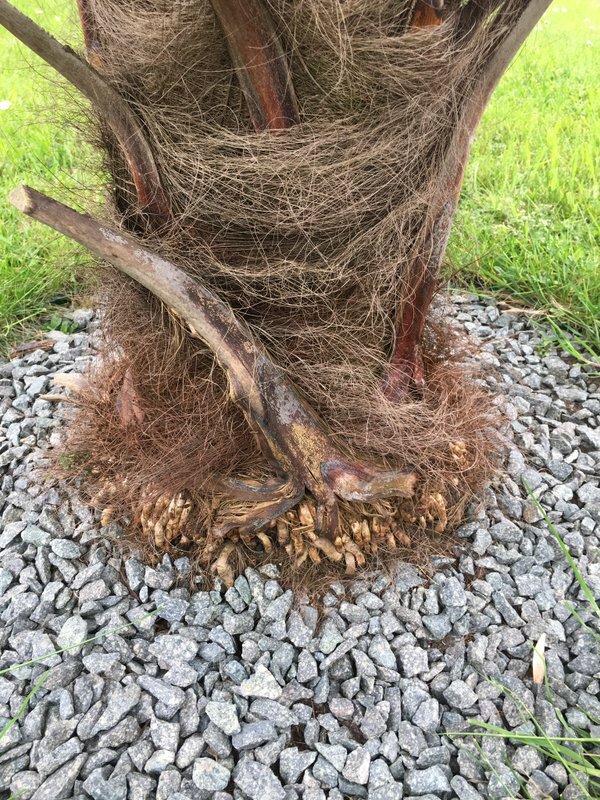 This brings us to the initial question, can the palm be planted next to the pond or pool or does the roots represent a danger to the liner? The answer is yes, it can! Palm roots are not aggressive and will always find the easiest way around. In this sense, the roots do not represent a danger to the pond or swimming pool liner. Assuming that the palm is not planted on impenetrable soil that is….! For the doubters it is enough to open any holiday brochure and see how large palms are sometimes even placed in the middle of a swimming pool islands. 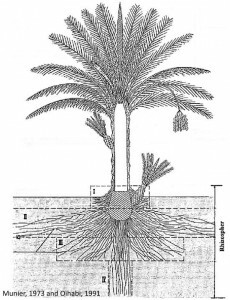 The chlorinated water will be much more an issue for the palm than the root system will be to the pool.